What Happened At Jesus' Trial? Home Jesus The True Easter Story What Happened At Jesus' Trial? REPRESENTATIVES OF ANNAS had secretly instructed the captain of the Roman soldiers to bring Jesus immediately to the palace of Annas after he had been arrested. The former high priest desired to maintain his prestige as the chief ecclesiastical authority of the Jew. He also had another purpose in detaining Jesus at his house for several hours, and that was to allow time for legally calling together the court of the Sanhedrin. It was not lawful to convene the Sanhedrin court before the time of the offering of the morning sacrifice in the temple, and this sacrifice was offered about three o'clock in the morning. 184:2.4 Shortly after the portress let Peter in, and while he was warming himself by the fire, she went over to him and mischievously said, "Are you not also one of this man's disciples?" Now Peter should not have been surprised at this recognition, for it was John who had requested that the girl let him pass through the palace gates; but he was in such a tense nervous state that this identification as a disciple threw him off his balance, and with only one thought uppermost in his mind—the thought of escaping with his life—he promptly answered the maid's question by saying, "I am not." 184:3.1 It was about half past three o'clock this Friday morning when the chief priest, Caiaphas, called the Sanhedrist court of inquiry to order and asked that Jesus be brought before them for his formal trial. On three previous occasions the Sanhedrin, by a large majority vote, had decreed the death of Jesus, had decided that he was worthy of death on informal charges of lawbreaking, blasphemy, and flouting the traditions of the fathers of Israel. That he was a dangerous traducer of the people. That he taught them impossible things and otherwise deceived them. That he was a fanatical revolutionist in that he advocated laying violent hands on the sacred temple, else how could he destroy it? That he taught magic inasmuch as he promised to build a new temple, and that without hands. 184:3.19 Already had the full Sanhedrin agreed that Jesus was guilty of death-deserving transgressions of the Jewish laws, but they were now more concerned with developing charges regarding his conduct and teachings which would justify Pilate in pronouncing the death sentence upon their prisoner. They knew that they must secure the consent of the Roman governor before Jesus could legally be put to death. And Annas was minded to proceed along the line of making it appear that Jesus was a dangerous teacher to be abroad among the people. 184:3.17 But Caiaphas could not longer endure the sight of the Master standing there in perfect composure and unbroken silence. He thought he knew at least one way in which the prisoner might be induced to speak. Accordingly, he rushed over to the side of Jesus and, shaking his accusing finger in the Master's face, said: "I adjure you, in the name of the living God, that you tell us whether you are the Deliverer, the Son of God." Jesus answered Caiaphas: "I am. Soon I go to the Father, and presently shall the Son of Man be clothed with power and once more reign over the hosts of heaven." 184:3.18 When the high priest heard Jesus utter these words, he was exceedingly angry, and rending his outer garments, he exclaimed: "What further need have we of witnesses? Behold, now have you all heard this man's blasphemy. What do you now think should be done with this lawbreaker and blasphemer?" And they all answered in unison, "He is worthy of death; let him be crucified." 184:3.19 Jesus manifested no interest in any question asked him when before Annas or the Sanhedrists except the one question relative to his bestowal mission. When asked if he were the Son of God, he instantly and unequivocally answered in the affirmative. 184:3.17 Annas desired that the trial proceed further, and that charges of a definite nature regarding Jesus' relation to the Roman law and Roman institutions be formulated for subsequent presentation to Pilate. 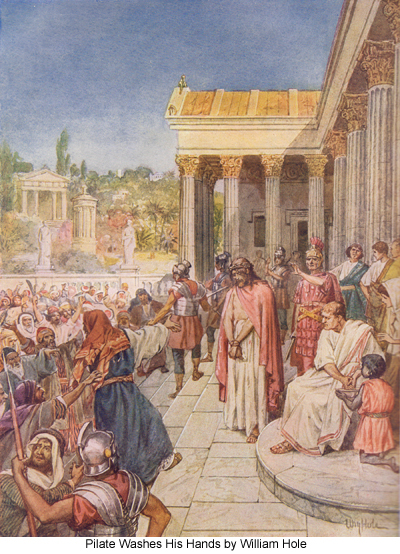 The councilors were anxious to carry these matters to a speedy termination, not only because it was the preparation day for the Passover and no secular work should be done after noon, but also because they feared Pilate might any time return to the Roman capital of Judea, Caesarea, since he was in Jerusalem only for the Passover celebration. 184:3.18 But Annas did not succeed in keeping control of the court. After Jesus had so unexpectedly answered Caiaphas, the high priest stepped forward and smote him in the face with his hand. Annas was truly shocked as the other members of the court, in passing out of the room, spit in Jesus' face, and many of them mockingly slapped him with the palms of their hands. And thus in disorder and with such unheard-of confusion this first session of the Sanhedrist trial of Jesus ended at half past four o'clock. 184:4.6 These are the moments of the Master's greatest victories in all his long and eventful career as maker, upholder, and savior of a vast and far-flung universe. Having lived to the full a life of revealing God to man, Jesus is now engaged in making a new and unprecedented revelation of man to God. Jesus is now revealing to the worlds the final triumph over all fears of creature personality isolation. The Son of Man has finally achieved the realization of identity as the Son of God. Jesus does not hesitate to assert that he and the Father are one; and on the basis of the fact and truth of that supreme and supernal experience, he admonishes every kingdom believer to become one with him even as he and his Father are one. The living experience in the religion of Jesus thus becomes the sure and certain technique whereby the spiritually isolated and cosmically lonely mortals of earth are enabled to escape personality isolation, with all its consequences of fear and associated feelings of helplessness. In the fraternal realities of the kingdom of heaven the faith sons of God find final deliverance from the isolation of the self, both personal and planetary. The God-knowing believer increasingly experiences the ecstasy and grandeur of spiritual socialization on a universe scale—citizenship on high in association with the eternal realization of the divine destiny of perfection attainment. 184:5.9 This entire procedure was irregular and wholly contrary to the Jewish laws. 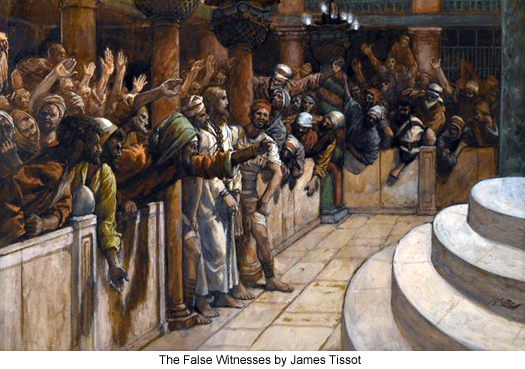 No two witnesses had agreed on any matter except those who testified regarding Jesus' statement about destroying the temple and raising it again in three days. And even concerning that point, no witnesses spoke for the defense, and neither was Jesus asked to explain his intended meaning. 184:5.10 The only point the court could have consistently judged him on was that of blasphemy, and that would have rested entirely on his own testimony. Even concerning blasphemy, they failed to cast a formal ballot for the death sentence. 184:5.11 And now they presumed to formulate three charges, with which to go before Pilate, on which no witnesses had been heard, and which were agreed upon while the accused prisoner was absent. When this was done, three of the Pharisees took their leave; they wanted to see Jesus destroyed, but they would not formulate charges against him without witnesses and in his absence. 184:5.10 While Jesus was in the room with John and the guards, and while the court was in its second session, some of the women about the high priest's palace, together with their friends, came to look upon the strange prisoner, and one of them asked him, "Are you the Messiah, the Son of God?" And Jesus answered: "If I tell you, you will not believe me; and if I ask you, you will not answer." 184:5.11 At six o'clock that morning Jesus was led forth from the home of Caiaphas to appear before Pilate for confirmation of the sentence of death which this Sanhedrist court had so unjustly and irregularly decreed. SHORTLY AFTER SIX o'clock on this Friday morning, April 7, A.D. 30, Jesus was brought before Pilate, the Roman procurator who governed Judea, Samaria, and Idumea under the immediate supervision of the legatus of Syria. 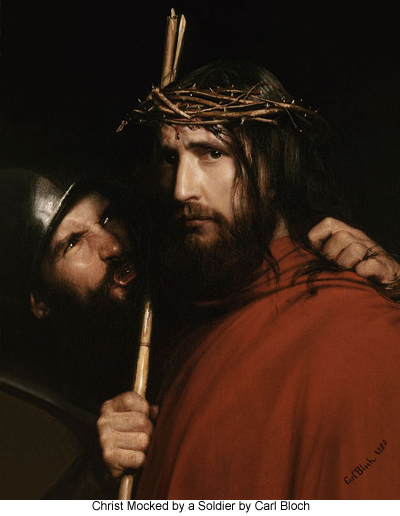 The Master was taken into the presence of the Roman governor by the temple guards, bound, and was accompanied by about fifty of his accusers, including the Sanhedrist court (principally Sadduceans), Judas Iscariot, and the high priest, Caiaphas, and by the Apostle John. Annas did not appear before Pilate. 185:1.1 If Pontius Pilate had not been a reasonably good governor of the minor provinces, Tiberias would hardly have suffered him to remain as procurator of Judea for ten years. Although he was a fairly good administrator, he was a moral coward. He was not a big enough man to comprehend the nature of his task as governor of the Jews. He failed to grasp the fact that these Hebrews had a real religion, a faith for which they were willing to die, and that millions upon millions of them, scattered here and there throughout the empire, looked to Jerusalem as the shrine of their faith and held the Sanhedrin in respect as the highest tribunal on earth. 185:2.4 To come before the Roman governor with this attempt at evasion discloses both the ill-will and the ill- humor of the Sanhedrists toward Jesus as well as their lack of respect for the fairness, honor, and dignity of Pilate. What effrontery for these subject citizens to appear before their provincial governor asking for a decree of execution against a man before affording him a fair trial and without even preferring definite criminal charges against him! 185:2.6 It was a few hours previously, shortly before midnight and after he had granted permission to use Roman soldiers in effecting the secret arrest of Jesus, that Pilate had heard further concerning Jesus and his teaching from his wife, Claudia, who was a partial convert to Judaism, and who later on became a full- fledged believer in Jesus' gospel. "Perverting our nation and stirring up our people to rebellion. "Forbidding the people to pay tribute to Caesar. "Calling himself the king of the Jews and teaching the founding of a new kingdom." 185:2.14 Jesus had not been regularly tried nor legally convicted on any of these charges. He did not even hear these charges when first stated, but Pilate had him brought from the praetorium, where he was in the keeping of the guards, and he insisted that these charges be repeated in Jesus' hearing. 185:2.15 When Jesus heard these accusations, he well knew that he had not been heard on these matters before the Jewish court, and so did John Zebedee and his accusers, but he made no reply to their false charges. Even when Pilate bade him answer his accusers, he opened not his mouth. Pilate was so astonished at the unfairness of the whole proceeding and so impressed by Jesus' silent and masterly bearing that he decided to take the prisoner inside the hall and examine him privately. 185:3.13 Pilate was confused in mind, fearful of the Jews in his heart, and mightily stirred in his spirit by the spectacle of Jesus' standing there in majesty before his bloodthirsty accusers and gazing down on them, not in silent contempt, but with an expression of genuine pity and sorrowful affection. 185:3.7 After questioning the Master, Pilate went back to the chief priests and the accusers of Jesus and said: "I have examined this man, and I find no fault in him. I do not think he is guilty of the charges you have made against him; I think he ought to be set free." And when the Jews heard this, they were moved with great anger, so much so that they wildly shouted that Jesus should die; and one of the Sanhedrists boldly stepped up by the side of Pilate, saying: "This man stirs up the people, beginning in Galilee and continuing throughout all Judea. He is a mischief- maker and an evildoer. You will long regret it if you let this wicked man go free." 185:7.5 Pilate was just about ready to release Jesus when Caiaphas, the high priest, approached the cowardly Roman judge and, shaking an avenging finger in Pilate's face, said with angry words which the entire multitude could hear: "If you release this man, you are not Caesar's friend, and I will see that the emperor knows all." This public threat was too much for Pilate. Fear for his personal fortunes now eclipsed all other considerations, and the cowardly governor ordered Jesus brought out before the judgment seat. As the Master stood there before them, he pointed to him and tauntingly said, "Behold your king." And the Jews answered, "Away with him. Crucify him!" And then Pilate said, with much irony and sarcasm, "Shall I crucify your king?" And the Jews answer ed, "Yes, crucify him! We have no king but Caesar." And then did Pilate realize that there was no hope of saving Jesus since he was unwilling to defy the Jews. 185:1.1 Here stood the Son of God incarnate as the Son of Man. He was arrested without indictment; accused without evidence; adjudged without witnesses; punished without a verdict; and now was soon to be condemned to die by an unjust judge who confessed that he could find no fault in him. If Pilate had thought to appeal to their patriotism by referring to Jesus as the "king of the Jews," he utterly failed. The Jews were not expecting any such a king. The declaration of the chief priests and the Sadducees, "We have no king but Caesar," was a shock even to the unthinking populace, but it was too late now to save Jesus even had the mob dared to espouse the Master's cause.